Last week Chris Riddle, KRA Principal Emeritus, came in to talk about the Living Building Challenge project he is working on as the Owner’s Project Manager (OPM) for the Hitchcock Center. He is working with DesignLAB Architects of Boston and Wright Builders of Northampton to provide the center with a new public environmental education building. 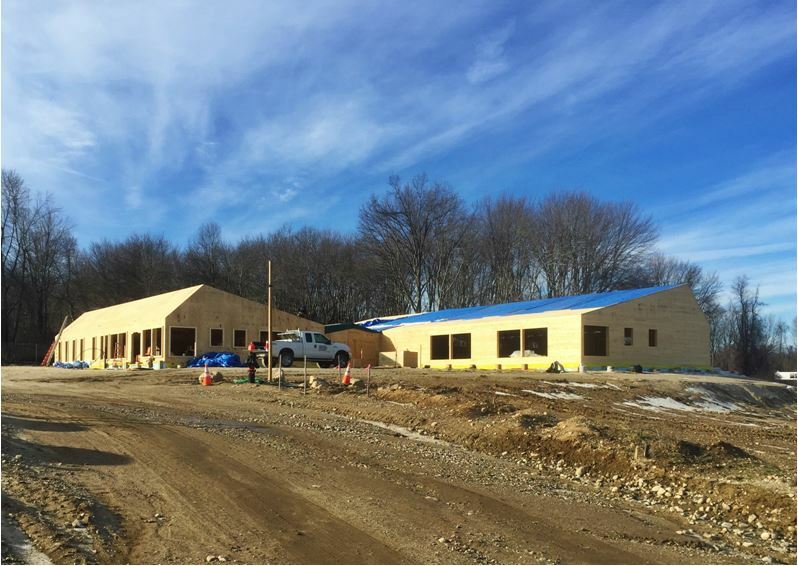 Located on Hampshire College ground, this new center will double their capacity for educational programs and promote sustainability in every way of life. Founded in 1962, the Hitchcock Center for the Environment “connects people with nature and encourages a deeper emotional bond with the natural world”. They accomplish this by providing environmental education programs with a focus on children as they are the next generation to make an impact on it. This includes promoting resilience, demonstrating sustainability in the built environment, understanding main topics in ecology and encouraging active citizenship. By 2020, through this new center, they hope to increase program participation from 8,500 to 11,500 children and adults and more than triple the center’s visitors. They’ll also increase their public hours from 35 hours per week to 60 hours per week, and expand their K-12 field trips. The opportunities that this Living Building Challenge project brings to the Hitchcock Center are innumerable and they are sure to take advantage to everyone. Within these petals are 20 imperatives that must be fulfilled to receive a full certification. For example, one imperative under the Place petal is Limits to Growth and looks to reuse land already built upon and preferably one that remedies contaminated land. The site of the new Hitchcock Center is located on an old apple orchard that was contaminated with arsenic before this project started but now is clean. Other major requirements of the LBC are that the project must supply 100% of its energy needs through on-site renewable energy and 100% of its water needs through recapture of precipitation or other closed loop water systems. Also, the use of “Red List” materials, which are worst-in-class materials, chemicals and elements that are known to cause harm to humans and the environment, must be avoided. If all 20 imperatives and 7 petals cannot be achieved but 3 petals can then the project is up for Petal Certification as long as one of the 3 petals is either water, energy or materials. If that cannot be accomplished the project may be recognized for a Net Zero Energy Certification. But if the project seeks to be recognized as a Living Building Challenge project it must complete all 7 petals and 20 imperatives which is what the Hitchcock Center is aiming to do. Chris Riddle was enjoying retirement when the Hitchcock Center approached him to be their OPM for this project. He said he never thought he’d be on a project like this but is very happy he joined because it has been a great educational experience for him and the whole team. The biggest challenge has been in the search for products that don’t use any of the materials and chemicals on the “Red List”. LBC prohibits certain toxins to protect the workforce along with the environment and ultimately want to promote the industry to make materials without them. “I agree with that,” Chris said, “You can build without them so why not?” This doesn’t come without its share of challenges however. Chris spoke about how it took 3-5 weeks to get a simple sheet metal housing for the sump pump because they couldn’t find a material that passed the red list test. The Living Building Challenge is still a very new standard so there isn’t a huge archive of products that pass their standards; therefore much of the research has to be done by the team itself on each project for every material. But Chris is confident that this will change once more of these projects are done and documented. Another challenge in regards to materials is that they need to be sourced as locally as possible. They break it up into four radii: 20% or more of materials construction budget must come within 500km of the construction site, an additional 30% from 1000km or closer, an additional 25% from within 5000km and the last 25% can be sourced from anywhere. This is to try to help promote local business and cut down on the embodied energy of the product. The team working on the Hitchcock Center is all new to LBC and as John Kuhn said “there’s a learning curve for everyone”. This education is what Chris Riddle and the Hitchcock Center value the most and that influenced parts of the design. To address the Water petal they could have just drilled a well, however they decided to collect rain water instead because they could show that happening and their visitors can learn from seeing it happen. It was agreed among us at the office that the Living Building Challenge isn’t right for every project and “getting close” but not getting the full certification is still a really good goal to strive for. However, there are great opportunities for educational institutions to take these on because they are in fact very educational for the team involved in creating it and the users after. LBC requires a community buy-in because everyone, the design team, the town, the contractors, board, staff and general supports of the program need to work together to make it happen. The new Hitchcock center looks to be completed summer 2016 and we are all excited to see the final product and the positive impacts it has on the community!